Cold sores are common, yet often painful, viral infections that forms near your mouth or on your lips. The virus is spread by close contact such as drinking after someone or kissing. According to the Mayo Clinic, cold sores are caused by strains of the herpes simplex virus (HSV). While they condition usually goes away on its own in two to four weeks, it can be a very uncomfortable experience. Over-the-counter medications can sometimes be expensive or cause unwanted side effects. If you have a cold sore, you should try out one of these natural remedies. Read on for more information. Everyday Health indicates that a bit of witch hazel on your cold sore can help relieve irritation associated with swelling and redness. Keep in mind; it can also dry out the wound and the immediate area around the sore as well. Cold sores often hurt and swell a bit. Ice is a simple solution. Simply apply the ice directly to the cold sore and allow the coolness to take over. This will provide momentary relief. Vanilla extract is alcohol-based which means that viruses have a difficulty surviving once it makes contact with this ingredient. 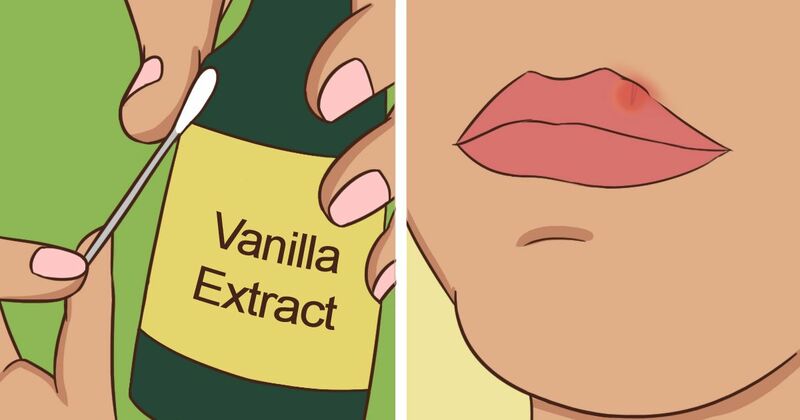 According to Everyday Roots, organic vanilla can wipe out a cold sore completely or at least help reduce the severity of symptoms. The antibodies in milk can help ward off viruses like cold sores. Additionally, according to Everyday Roots, milk also contains l-lysine which fights back against amino acids that can cause an outbreak. Cold sores can be very painful. The soothing anti-inflammatory properties found in aloe vera make it an excellent choice for combating cold sores. According to Healthline, indicates that applying the gel directly to the troubled area can provide relief. If you want to kill the virus that causes cold sores, try drinking some peppermint oil. According to Everyday Roots, when peppermint oil is applied directly to the sore, it leads to a faster healing time. Everyday Roots describes cornstarch as a good option for cold sores because it neutralizes the pH levels of the troubled area. Without an overly acid environment, the virus cannot thrive. Lemon balm can be useful in promoting a faster healing time for cold sores, according to Healthline. The astringent properties of the lemon help keep infection down and ward away any other bacteria. Everyday Roots indicates that making a paste with licorice powder could help soothe your fever blister. The reason it is so effective is due to the acid that helps stop the spread of the virus. Plus, the anti-inflammatory and anti-viral properties contribute to reducing the redness and swelling around the infected area. Which natural remedy do you use for cold sores? Keep the conversation going by sharing with your friends.